Most anglers don't own boats. Instead these folks fish from shore, use a kayak or canoe, or even rent or borrow a boat for their outings. Traditionally they've been shut out from the technology of modern fish finders.. But not anymore. For these anglers, we've identified this year's top portable fish finder: the Garmin Striker 4. While portable fish finders have become increasingly common in the marketplace, few are deserving of serious consideration. But you can avoid substandard and poorly functioning models by starting your search with the five models detailed below. The Garmin STRIKER 4 with Portable Kit is designed to be a high-powered, feature-packed portable fish finder, which you can bring along anywhere your fishing adventures take you. This kit comes with a display unit that features a 3.5-inch, full-color screen, a dual-beam CHIRP sonar transducer and a protective carrying case to keep your fish finder safe while traveling. Capable of scanning accurately to extreme depths, you’ll find that the Garmin STRIKER 4 works at depths of up to 1,600 feet in freshwater or 750 feet in saltwater, making it a fine choice for offshore anglers. The STRIKER 4 features an included GPS circuit, which gives you the ability to track your trolling speed and mark productive fishing spots, thanks to the waypoint feature. You can use the split-screen zoom function to analyze two different types of data at the same time, and Garmin’s Fish Symbol ID software makes it easy to spot fish at a glance – no longer will you have to interpret vague arcs on the screen. The STRIKER 4 also gives you the ability to see structure and fish while traveling at relatively high speeds with the Ultrascroll function. The tilt-and-swivel mounting system and the included temperature sensor round out the feature list, and further illustrate the value of this portable fish finder. 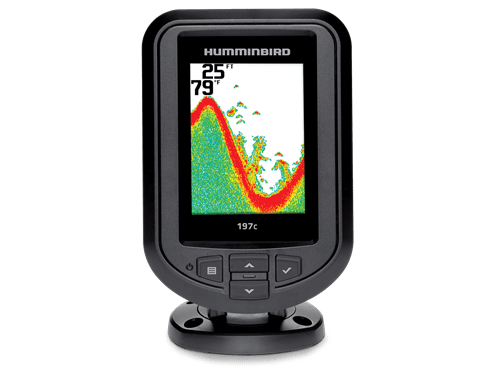 Humminbird is one of the leading manufacturers of fish finders, and their portable unit – the PiranhaMAX 4 – is built to the same standards as the rest of the company’s impressive lineup. Designed to easily work on your kayak or a rented boat, the PiranhaMAX 4 mounts quickly and easily thanks to its suction-cup-mounted transducer and lightweight display. A carrying case even comes with the top end model in the PiranhaMAX 4 line, which makes it even easier to pack up and take with you, while protecting the unit from damage. The case is particularly useful for ice fishing. Although this is a relatively small and affordable unit, the specs are pretty solid. Depending on the model. the PiranhaMAX 4 features either down-imaging or dual-beam sonar. The transducers accurately reads bottom contours to depths of 600 feet, which is far deeper than most of the other portable fish finders on the market. Display-wise, the PiranhaMAX 4 boasts an impressive 256-color display screen that measures 4,3 inches from corner to corner, a 20% size bump over prior models. A simple push-button interface makes it easy to use this unit while you are fishing, and the included dual-beam sonar ensures that you’ll see every nook, cranny and nuance lurking below your boat. The PiranhaMAX 4 also includes fish ID functionality and sounds an alarm when fish are spotted crossing the beam. Unlike many other portable fish finders, which rely on small batteries that you must replace frequently, the PiranhaMAX 197c PT is designed to hook up to a 10.8-20 VDC battery. It also features a tilt-and-swivel mount so that you can see it easily and adjust it on the fly. In all, the PiranhaMAX 4 is a tidy package. The FishHunter Directional 3D is Lowrance’s version of a portable fish finder, and the first in our comparison review that brings in the castable-transducer element. Made with the same dedication to quality and innovation as most other Lowrance products, the FishHunter Directional 3D is a great option for anglers seeking a powerful and feature-packed sonar unit that is still easy to transport. The FishHunter offers a number of features and capabilities that set it apart from other portable fish finders. For example, The FishHunter uses multiple transducers (five in total) to help collect a ton of data from beneath the surface, instead of the single-transducer designs that are typically standard for portable fish finders. Additionally, by utilizing five transducers, the FishHunter Directional 3D can provide directional fishing data, which will help you decide which direction to cast. It's a pretty interesting innovation. Capable of probing waters up to 160 feet deep, the FishHunter’s transducers emit three different frequencies, which helps to provide accurate images of objects at varying depths. 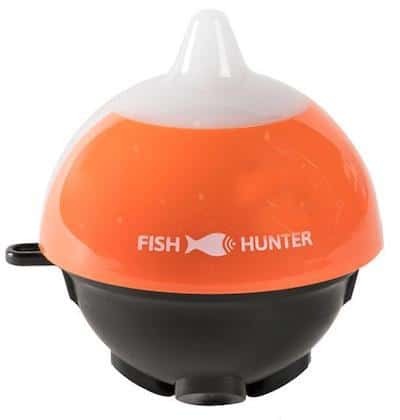 As mentioned, the the FishHunter is a castable unit, meaning it connects to your smartphone via a WIFI connection, which transmits data at four times the speed of Bluetooth-enabled sonars, and it works up to 200 feet away, more than enough for a long cast. While casting a transducer can be gut-wrenching at times, it's a great innovation that extends a portable fish finder's use to shore anglers. Instead of a dedicated display, as with all castable portable fish finders, it relies on an angler's smartphone to run the display/control software. The FishHunter includes a dedicated flasher function, which is great for ice fishers and anglers who like to vertically jig in deep water. And lastly – and perhaps most impressively – the FishHunter allows you to make your own custom, 3D maps of the waters you’re fishing. Unlike some other units that have clunky map-making interfaces, the FishFinder’s mapping software is easy to use: Simply cast the unit out, activate the mapping function and start reeling in the transducer. 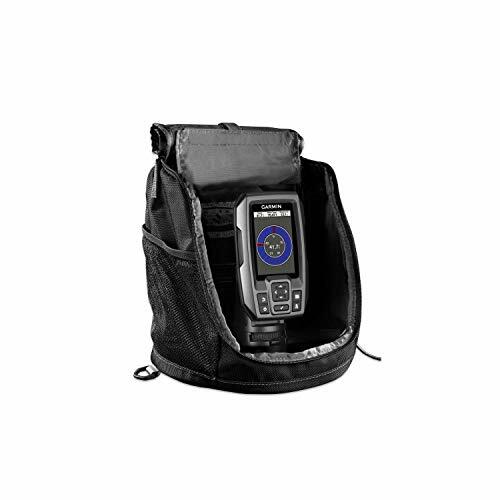 The Deeper Smart Sonar PRO+ is designed to be the most powerful castable portable sonar unit available. While it uses the same type of castable transducer as the handful of other castable/portable fish finders, the Deeper Smart Sonar Pro+ transmits back to the angler's smartphone or tablet at much greater distances and deeper depths than its competitors do. In fact, you can use the Deeper Smart Sonar Pro+ at distances of up to 330 feet, thanks to its high-speed WIFI connection, and it accurately collects data to depths of 260 feet. 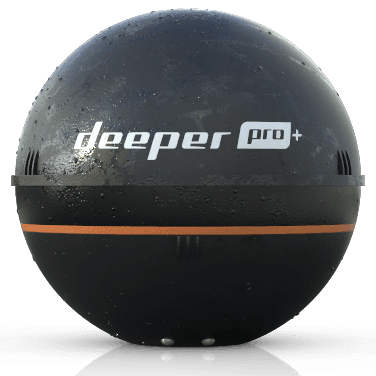 The Deeper Smart Sonar PRO+ also layers on an integrated GPS module, which further helps set it apart from similar products. You can even create your own GPS-compatible maps with the Deeper Smart Sonar PRO+, so you’ll always be able to interpret structure and underwater features, even in your top-secret fishing holes, for which maps and charts are unavailable. Maps are all managed via the company's Lakebook software, which is much better than Lowrance's, as a comparison. That map management software reflects the quality of the fish finder smartphone app, which frankly is better looking than most all dedicated, high-end marine electronics. It's a reminder that many times the software is an afterthought for fishing technology. In all, the unit produces some of the sharpest images of any portable fish finder on the market, at distances and depths that really define the castable portable fish finder category. The Hawkeye FishTrax Fish Finder is a powerful, yet affordable sonar unit that will help you find and catch fish, no matter where your travels take you. 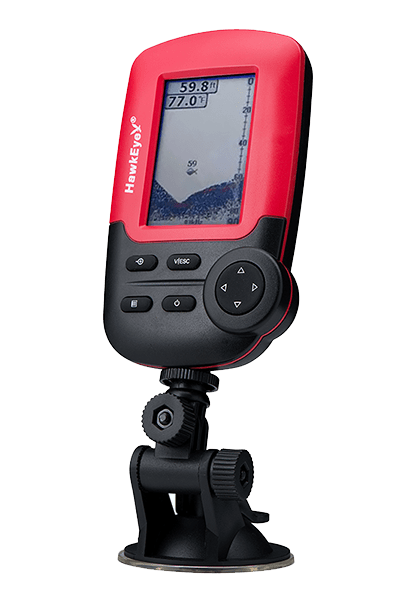 Consisting of a floating transducer and a hand-held display unit, the Hawkeye FishTrax works without the need for a smartphone, and because the two components utilize a hard-wired connection, you won’t have to worry about the data transmission problems that sometimes plague castable, WIFI- or Bluetooth-enabled products. You can use the transducer in several different ways; you can float it alongside your boat, let it drift behind your boat while trolling or you can even mount it to the side of your vessel. The Hawkeye FishTrax is packed with useful features, including a dedicated flasher mode, audible fish and depth alarms, dual-beam sonar signaling and a 100-level sensitivity adjustment, which makes it easy for anglers to reduce screen clutter when necessary or appreciate the finest details and smallest fish. Accurate to depths of 240 feet, the Hawkeye FishTrax will work for offshore anglers as well as those fishing from the bank of their local pond. The Hawkeye FishTrax features a high-definition, full-color display and utilizes Hawkeye’s proprietary EasyTouch interface, which allows you to scroll through screens or change the sonar settings quickly and easily, so you can go back to focusing on the fish. And, just to give you peace of mind, the Hawkeye FishTrax comes with an industry-leading two-year warranty. Anglers looking for portable fish finders have different reasons for doing so, depending on which of the handful of use cases best describe them. Let's take a quick look. Instead, these mobile anglers can use a hand-held fish finder with a throwable wired transducer or a smartphone-connected, castable fish finder transducer. Either one is light enough to transport easily, and won't have any setup time. Since many portable fish finders use temporary mounts or no mounts at all, they can be a good choice for boat owners who are nervous about leaving a fish finder display and/or transducer mounted to their boat. Many portable fish finders feature an ice fishing flasher function, making them the only solution for the ice fisher looking to detect fish for accurate angling in an iced-over water column. In many cases, fish finder manufacturers offer a portable bundle that's a great solution for adapting a traditional fish finder to a portable configuration appropriate for ice fishing. Lastly, some anglers are just looking to avoid spending hundreds or even thousands of dollars on a traditional fish finder. For these budget-conscious anglers, a portable fish finder can be a great alternative. This is especially true of the latest generation of castable portable fish finders, which have concentrated the technical investment in the transducer and software, essentially outsourcing the display investment to the angler. Some of these portable fish finders are essentially similar to traditional sonar units, except that they are usually smaller, lighter and include easily mounted transducers. Others rely on floating transducers, which can be cast hundreds of feet from the shore or boat, and a few forego a display screen entirely and instead allow you to view the data collected via your smartphone or tablet. For the most part, the features you’ll want in a portable fish finder are similar to those you’d want in a conventional unit. 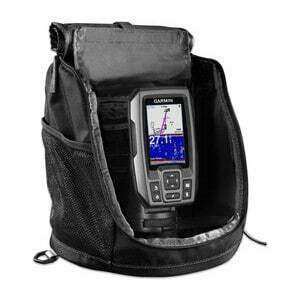 However, there are a few additional things to look for when picking out a portable sonar too. We’ll discuss a few examples of each below. Regardless of whether you want a conventional fish finder or a portable model, you’ll always want to select a model that has a high-quality display screen. This is the only way to be sure that you’ll be able to see the details and data collected by the transducer. However, screen quality is especially important when selecting a portable fish finder, given that most models have rather small displays. Note that several of the portable fish finders on the market work in conjunction with your smartphone, rather than a dedicated display screen. In such cases, you’ll need to ensure your phone has a high-quality display. Wireless connectivity is an extremely important feature that most 21st century anglers want in their portable fish finders. You may, for example, want to send the data from your fish finder to your tablet or desktop computer, or you may need to transfer data in the other direction. Either way, you’ll need a fish finder with wireless capabilities. It also makes it easier to download software updates as they become available. Most fish finders provide this functionality via a Bluetooth or WIFI system. Both technologies have strengths and weaknesses, and personal preference should guide your choice. Note that older fish finders may connect with computers and other devices via a cable of some type, rather than a wireless connection. This will obviously work, but it is hardly convenient. Just because you are fishing from the shore or a small boat doesn’t mean you can’t benefit from the information provided by a GPS unit. In fact, GPS units are very helpful for anglers who prize portability, including ice anglers, kayakers and those who like to search for hidden ponds and creeks. Fish finders with GPS functionality typically allow you to mark productive fishing spots or unique points of interest by using a waypoint feature, and some also allow you to utilize maps or charts, just like most permanently-mounted fish finders do. Fish finders utilize a variety of different user interfaces, and some are much easier to use than others. Although you can certainly learn to use the interface any given fish finder uses, you’ll spend less time figuring things out and more time fishing if you select a model that you can operate intuitively. Look for a fish finder that displays information in a way that’s easy for you to grasp at a glance and utilizes a navigational structure that makes sense to you. You may not find a perfect interface, but you’ll be well-served by selecting the one that suits you best. Anglers who fish very small waters are rarely able to access high-quality maps of their favorite pond or creek. But some fish finders allow you to make your own map, which you can then store on the device and use as you would any other map. Some of the best fish finders allow you to incorporate GPS data into your custom maps or plot out things like vegetation and substrate transitions, which makes them even more useful. Every angler wants a fish finder that is easy to use, but for those seeking portable fish finders, this primarily means selecting a fish finder that is easy to mount or deploy. You don’t want a transducer that must be bolted into place, nor do you want a display unit which must be attached to a rail system or console. Ideally, portable fish finders should feature floating transducers or transducers that can be attached via a suction cup. It is also helpful to choose a model that features a padded carrying case, to help protect your tool during transport. Range is always an important factor to consider whenever you are using a fish finder with a floating transducer. This is true whether you are using a model with a tethered transducer or one that connects wirelessly to your smartphone or an included display unit. The greater the range, the more quickly you’ll be able to scan or map out the water. This will help you make better use of your limited time on the water and improve your odds of catching a stringer full of fish. But while range is an important factor for all anglers to consider, it is especially important for those fishing from the shore and using a castable transducer. Without a boat or kayak, shore-bound anglers can only scan the water within the boundaries of their transducer’s reach, so these types of anglers will obviously want the greatest range possible. Although all the entrants in the category represent solid choices for anglers looking for flexibility and value as they choose among portable fish finders, three of them rise to the surface for their own reasons. The Garmin STRIKER 4 with Portable Bundle is clearly the best fish finder in the portable category, and it is easy to see why it was selected as the category winner by Fishing Tech. The specs are on another level compared to the rest of the category, and the company has a legacy of delivering quality electronic components that can give an angler confidence in the field. Packaging the solid STRIKER 4 unit in a no-nonsense portable package makes our winner a no-brainer. FishingTech's Tech Innovator award is given to technologies that deliver a glimpse of the direction for a category, and FishHunter's Directional 3D takes the prize among Portable Fish Finders. Castable fish finders that lean on an angler's phone or tablet represent an interesting development for the category, but FishHunter really layers on the innovation by packing in 3D visualization of the underwater environment along with the actionable directional assist. In all, an exciting package. HawkEye's FishTrax 1C is an example of proven, solid-state technology taken to its logical conclusion. With this model, HawkEye has taken no chances and delivered a great suite of value at an absolute bargain price. Unlike the castable fish finder models that limit their offering to the transducer pod to reduce cost, the FishTrax doesn't introduce "phone anxiety." Anglers looking for a flexible fish finder solution at a stocking stuffer of a price should take a hard look at this offering.